Best of Nordstrom Half Yearly Sale - the very best of the sale! It’s the Nordstrom Half Yearly Sale! Ho, ho, ho!! It’s me, after Christmas Santa, and I’m here to tell you that I know the best items to spend that Christmas money on! Grandpa gave you a crisp $20 and it’s burning a hole in your pocket?! Look no further! Ha ha but seriously, the Nordstrom Half Yearly sale is on and it’s GOOD. Click here to access the sale. I literally bought a few great items and got them in the mail on Saturday, and now they are 40% off!! I LOVE this cardigan that I’m wearing in the photo above. It’s true to size (I’m wearing a small), soft as butter and yes, 40% off. I wear this cute and cozy sweatshirt almost every single day over my workout clothes to the gym. I got a size 6 and it’s perfect so look at the sizing chart. Look at how cozy this sweater is! I wore this sweater yesterday and love it. It’s perfect with high waisted jeans and runs true to size. 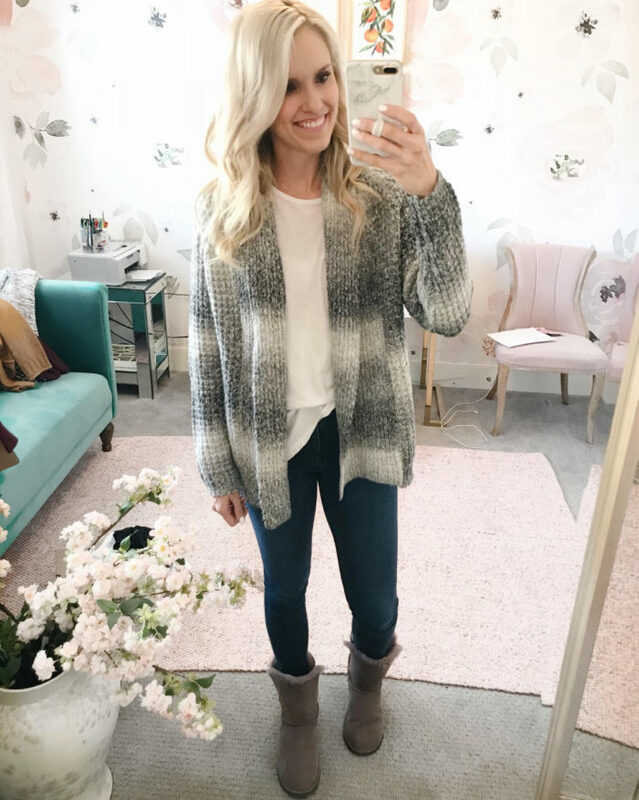 I scoured the entire Nordstrom Half Yearly Sale to find the very best items that I either have and absolutely love, or that I’m going to be ordering, or that I really want! I’m SUPER excited to show you guys the best of the sale. Click on each image below to take you to that item and hurry and purchase if you want something because items sell out fast in this sale.